The University of Ulster has been chosen to deliver a new Parliamentary Studies module, approved and co-taught by the Houses of Parliament. This project has the support of the Speakers of the House of Commons and House of Lords and Ulster is one of only 13 universities chosen to deliver the module from September 2013. The module gives students a detailed knowledge of how the UK Parliament works, through seminars delivered by senior Parliamentary staff as well as University of Ulster tutors, and is designed to be of particular value to those considering a career in politics. The news came as Secretary of State for Northern Ireland Theresa Villiers visited the University of Ulster's Jordanstown campus to meet staff and students of the the School of Criminology, Politics and Social Policy. 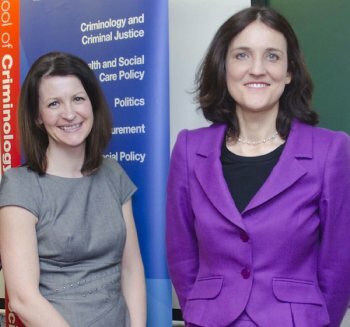 Dr Cathy Gormley-Heenan of the University's Faculty of Social Sciences (pictured left above with Secretary of State Theresa Villiers) said: "We're delighted that Ulster has been selected by Parliament as their Northern Ireland partner in delivering this prestigious course. "Beginning in September 2013, 20 Ulster students will have the opportunity to take this course, which will involve study visits to the Houses of Parliament, where they will meet MPs and Parliamentary officers to gain a unique level of insight into the functioning of representative government in the UK – and give them an opportunity to apply the knowledge they have gained in the University to the real world of parliamentary political life." Students studying the module will have the chance to visit the Palace of Westminster, as well as receiving talks at their university from Parliamentary clerks covering a range of topics from the legislative process to the changing role of the House of Lords. The new Parliamentary Studies module has been piloted at the University of Sheffield in 2012/13 but as part of Parliament’s Outreach Service commitment to expanding the roll-out of the module, a small number of selected universities have been chosen by a judging panel to deliver the module from 2013/14. Universities chosen are: Birkbeck - University of London, University of Bristol, Cardiff University, University of Edinburgh, University of Hull, University of Leeds, University of Leicester, University of Manchester, University of Nottingham, University of Sheffield, University of Strathclyde, Swansea University, and the University of Ulster. The Scottish Parliament, the National Assembly of Wales, the Northern Ireland Assembly and the UK Office of the European Parliament are also involved in the delivery of the module, providing support and teaching on relevant seminars. 5. Parliament's Outreach Service raises awareness of the work, processes and relevance of the institution of Parliament, with the aim of increasing levels of public engagement. It is a bicameral service and part of a strategy endorsed by both Houses to strengthen the connection between Parliament and the public.